Atlus brought Irem's R-Type Tactics to North American PSPs last year as R-Type Command, a turn-based strategic deviation from the side-scrolling shoot 'em up the series is known for. A sequel is planned, with an amazing subtitle. R-Type Tactics II: Operation Bitter Chocolate will be coming to Japan on October 29, according to a report from 1UP. In addition to telling the tale of semi-sweet chocolate in space, the next R-Type Tactics will pit human against human, one side of which has adopted Bydo alien technology, the other which logically resists such an abomination. 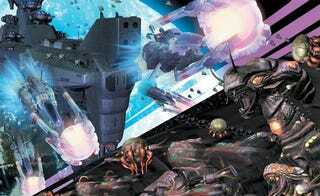 Expect twice as many units in R-Type Tactics II: Operation Bitter Chocolate, the same hex-based space military strategy and a level of dry gameplay similar to the first. Will Atlus be sweet enough to bring the sequel stateside? Sounds perfect for a downloadable PSN title.